One other thing about the 'infomercials' that I mentioned in my last entry: the LA Times article reports that the informercials "will be largely targeted at the baby boomers who 30 years ago fueled the music industry but who today buy fewer albums". A Universal Music president is quoted as saying, "Nobody has found a way to capture the 40-year-old and older audience". Though a slew of statistics that have been issued recently suggests that the older audience isn't sitting passively waiting to be 'captured' but is actively researching and buying more music than ever before. This connects with my essay at the start of the year about the increasing breadth of both the ages of popular music buyers and the eras of music being listened to. 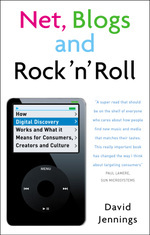 The argument there was that a combination of demographic, technological and cultural factors that resulted in the upheavals of rock'n'roll and punk. At the time, these youth-led 'revolutions' seemed to change the landscape irrevocably, but from further away it's easier to see the continuities and the traditions that stretch back well before Elvis released his first single. Recent statistics give quantitative support for these ideas. The International Federation of the Phonographic Industry reports that the average age of music buyers is increasing, with 55% of music bought by people over 30 (the UK-only figure is even higher at 66%). The September issue of Five Eight refers to this group as 'middle youth'. Are middle youth alone responsible for the fact that 32% of the albums sold in the UK last year were 'catalogue' sales (defined as "anything released prior to the year before the current one")? Or is that — aside from the singles market, which has been shrinking — other parts of the audience are less geared to the ephemeral music-of-the-moment, and more willing to explore longstanding artists and traditions? Five Eight argues, on the basis of magazine ABC figures, that, "It is rock titles with a particular focus on classic heritage acts (Q, Mojo, Uncut, Classic Rock, Word) that are the true motors of the British music press now". For the first time, some of these titles are selling more copies than the likes of Top of the Pops magazine, having overtaken the New Musical Express some time ago. As recognition of tradition and an embracing of diverse musical styles become the norm, so popular music has lost its role as a marker of generational and sub-cultural (mods, rockers, ravers, goths) faultlines. It would be a mistake to proclaim this as an 'end of history' moment, because the wheels of demographics, technology and culture have not stopped turning, and tensions will return sooner or later. For the moment, music and music buyers and looking longer and further in the rearview mirror.